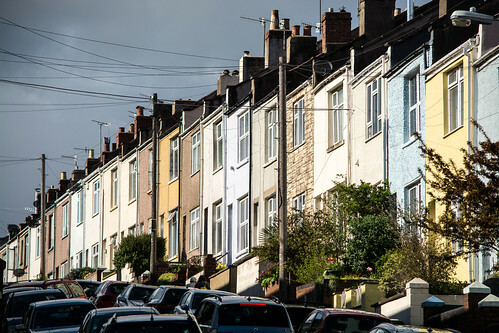 Here’s a row of houses in Southville, Bristol near where I live. I’m hoping to have a burst of photographic activity now, having just taken delivery of a new camera, a Panasonic G9, last week. And now for an appeal: Bristol Refugee Rights, where I’m chair of the board of trustees, is a charity providing support, advice, education, meals, social space and other services to refugees, asylum seekers and other vulnerable migrants in the Bristol area. Funding is always tight, and we desperately need to raise £29,000 to keep our advice services running. We’ve started a crowdfunder to this purpose, and I’d urge everyone (especially if you like these Sunday photos) to contribute. Good construction capturing housing and tenants, suggested by the packed parking mirroring the packed housing. Speaking of mirroring, please do keep us apprised of your impressions of the G9–I haven’t gone mirrorless and I’d be very interested in your feedback on that. Hi Alan: the main problem with mirrorless, to my mind, was the viewfinder. Up to now they’ve lacked the transparency and immediacy you get with a good DSLR viewfinder. But the G9’s has fantastic magnification and you get to see exactly what you are photographing, so I think they have this one sorted now. Lower weight and no mirror-slap noise are bonuses, higher battery-consumption is a negative. As a someone who likes Sunday photos and used to volunteer as an advisor for refugees in Newcastle I have made a donation. If you would like to also make a donation to North England Refugee Service I am sure they would be very grateful.